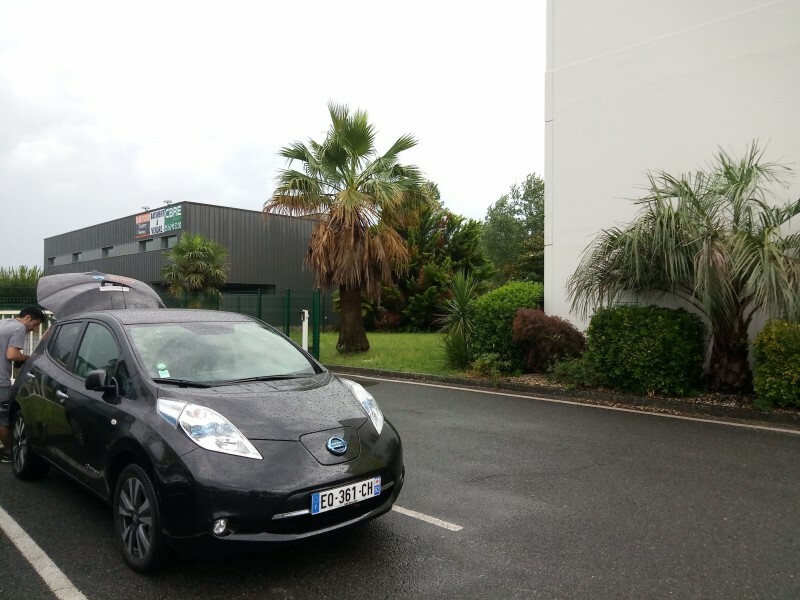 At the beginnig of the month, Nissan LEAF hired and hotels booked, we made our way down to Bordeaux. Normally this would be a four hour drive, but with an electric car and extreme heat making multiple rapid charges just not possible, we made it via other destinations. On each overnight point (for a slow charge but also to see what is out there) we spent two days there and back, the first point was Tours, landing late on Monday night after traffic from hell out of Paris and a brief stop in Orléans to charge, we didn't have much to do there the first night. The city is beautiful and much like most larger french towns, there happens to be a very functional tramway. While still in a city, it has a very chill and picturesque feeling to it with the islands nestled on the river. Our second stop was La Rochelle via Poitiers, since we were taking the Eco route (basically every possible mix of country road available) we had the opportunity to land in Dissay in front of the Château. In fact during the entire long route, we stopped in some of the nicest areas possible, which certainly was much nicer than the mundane and expensive Autoroute version of this trip. At La Rochelle, it was a bit of a strange atmosphere, the side streets completely dead on a Wednesday night, but once we found our way to the Marina it was clear where everybody was, terrasses as far as the eye could see on the beautiful backdrop of the sun setting. 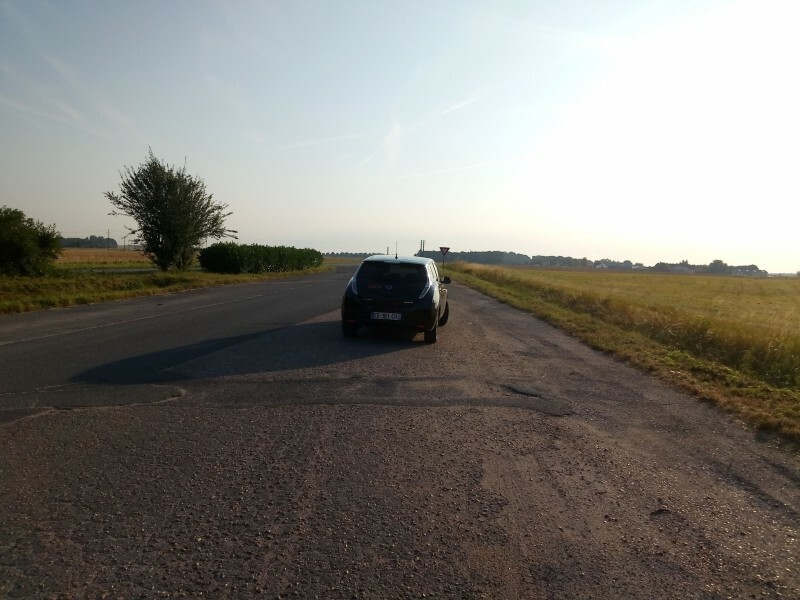 The following day we made our way down to Bordeaux, having wandered around La Rochelle most of the evening, unfortunately, since our best chance of a charge was on the autoroute, we had to take that down towards Saint André de Cubzac from Saintes. I can't really say much of anything interesting happened, although the rapid charger was not really giving us anything, we stopped in the aire to do a two hour slow charge to make it to the backup plan charger. At that time we started to get the orage from hell starting to hit, visibility zero and zipping down the autoroute at a hair raising 90kph. When we made it to the point in Saint André de Cubzac to charge the weather was the most pleasant I've ever seen. Since we ditched the orage 50km back, we thought we were clear. But the charge in course knocked an hour off our time to Bordeaux, just in time to have the orage crash back down on us with it's full fury. It was like hurricane conditions, no way to see, hail smashing the car, branches dropping from the trees and finally on the way through, an actual tree fell on the road. I never thought it was possible to think of 30kph as excessive speed, but I can assure you it probably was. But as soon as it started, it was all over and we made it through to Bordeaux with a bit of rain and no damage. Car still charged with some serious kilometerage, we made it to the hotel. Bordeaux in itself is lovely, having not needing a lot of charge for the route back, we went out for dinner and took the tramway, Bordeaux's tramway system was quite interesting, how they repurposed previous freight train lines to create a far reaching system. As we got towards our tram stop, the orage hit again and we spent the evening eating indian food soaking wet. 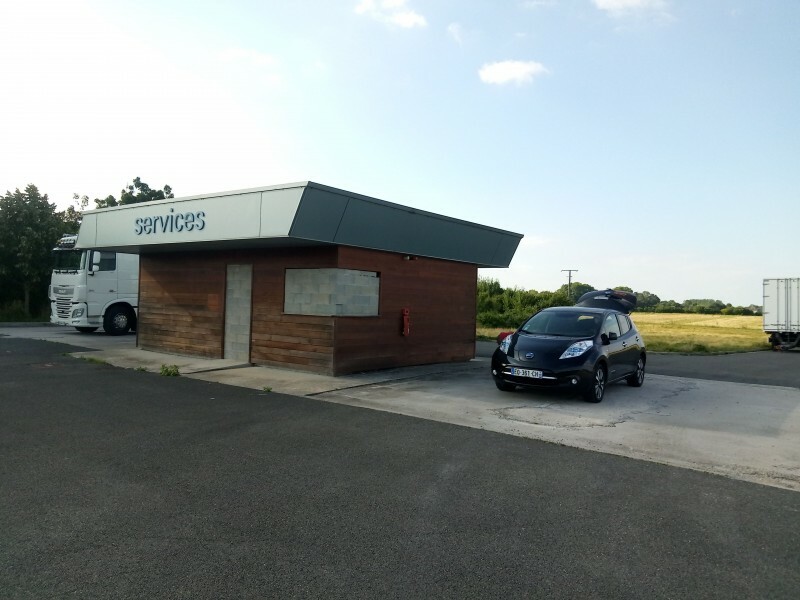 The next day, I found a parking in Bordeaux with a slow charger to top the car off in the centre, we had a good wander around seeing all the sights and beauty of the wine region while the car did it's thing. One thing I didn't bank on was getting back out of Bordeaux, for you see it is one hugh chantier with one way systems and it's easy to get lost or in some cases, go the wrong way down one of these unmarked one way streets. Thankfully we got out and the next day, since the car was charged up we took the tram rather than fight our way in and out. The way back we went via the way we went in Bordeaux > La Rochelle > Tours > Orléans stopping off for a second day in La Rochelle & Tours. When we stopped off in Poitiers, we went to eat at a restuarant in a shopping mall (our rapid chargers were all at Auchan), nothing spectacular it looked like, but my god did they make an amazing pizza (Café 20 if you're interested). 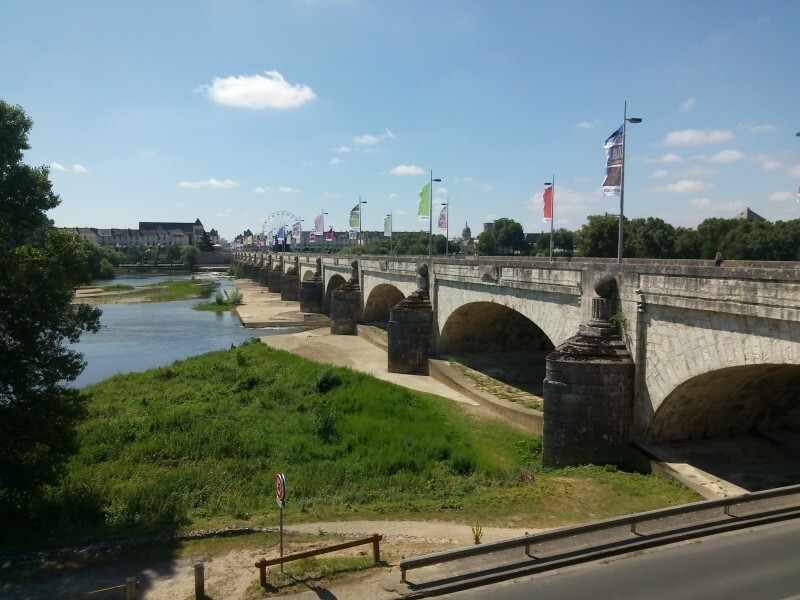 One of the things we cheated on the first night was taking the autoroute from Blois to Tours since it was midnight, but on the way back it was purely amazing. The route on the side of the river between Tours and Orléans is one of the most beautiful places I've had the opportunity to see, especially since we needed to be back in Paris for 12h Sunday, leaving at 6h was a very good choice, the sun hitting the country side was superb, with hot air balloons taking off in the horizon. In total we did 1.450km, it took 6 days but would I recommend it ? HIGHLY, France has a lot to offer, and you miss a lot of it through the autoroute. This trip took days of planning to make sure we didn't breakdown, but driving through amazing forests in pure silence from an electric car, is indeed something you can enjoy a lot. All the photos from the trip can be found here.